Aerial Work Platforms, commonly known as scissor lifts, are ideal for performing work safely at various heights in and around a warehouse while at the same time offering the ability to be mobile (drive) when in the air. 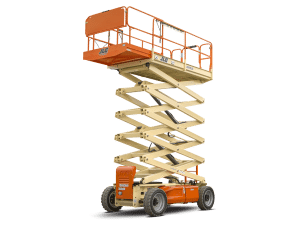 JLG Scissor Lifts are commonly rented to perform tasks such as HVAC maintenance, electrical work, and running various piping or cable throughout the facility. Even security and IT install tasks become safer and faster with a scissor lift. Operators should always take safety into consideration before using a scissor lift. Jamco recommends getting a good-quality safety harness anchored to the scissor lift platform before operating the unit. JLG Scissor Lifts have a built-in 110/120AC outlet on the platform that give you the ability and convenience to plug in power tools. Most common rental specs for a scissor lift are 19’ (25’ working height) & 26’ (32’ working height). Copyright © Jamco 2017. All rights reserved.